It is a matter of time - You will do great Aishah! I give high salute to parents yang anak-anak dah boleh menghafal Al-Quran, hafal semua doa-doa penting dalam hidup seawal umur 3 atau 4 tahun. To be frank, Aishah is yet to achieve that level and we are trying to guide her. Personally, bila nak mengajar atau mendidik Aishah (particularly because akif is still small for such), I would like to look back on to what I capable of doing at her age last time. I don't want to burden my kids at all. At least it can be the reason for me not to force Aishah to do something beyond her capability. I remember, the time I can memorize bacaan doa makan perfectly was at the age of 7, I can read Al-Quran perfectly at the age of 7 as well. I know how to perform prayer perfectly at the age of 9. None as early as age 3 or 4, not even at the age of 5. So, we going to practice the same to Aishah maybe. 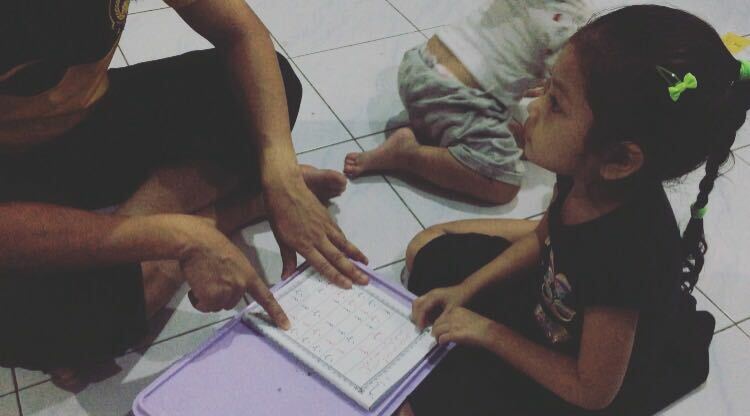 Either small or big, cepat atau lambat, we will make sure Aishah knows all the important basic things in life. It is just a matter of time, sooner or later, Aishah pun boleh baca doa makan sendiri, bukan sekadar miming seolah-olah dia tahu. Same things goes to reading a book. 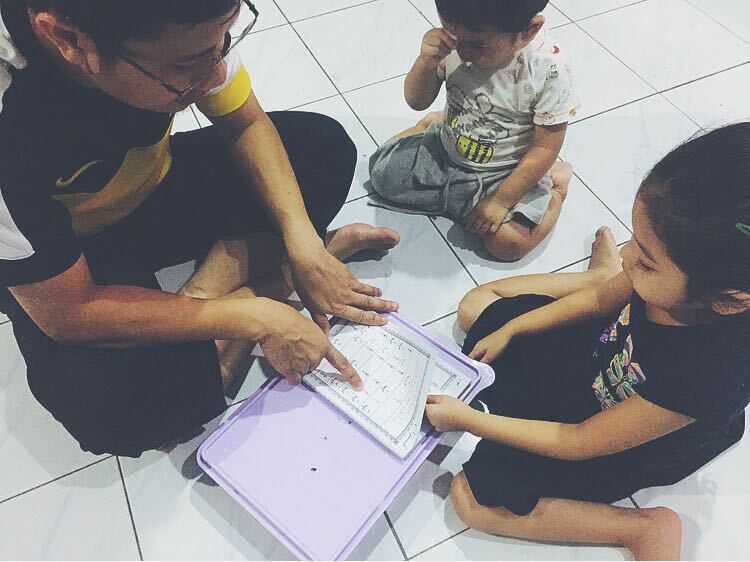 Aishah is still at the process of recognizing the letters. I know that some of my friend's kids can read book themselves at Aishah's age, but like I always believe, no need for rush. It's not about time! I remember last time, I can read book perfectly at the age of 8. I was not a good student during my secondary school. I was too "slow/passive" during my childhood times. No one would dare to be friend with me that time I think. No matter how inferior it was, in 2002, I was awarded as SPM Best Achiever (Best Student) at my school. So yeah, it is a matter of time for my kids as well. Why rush? You not going to change the world though! As for now, what i can be proud of Aishah is her ability to speak English, sometimes better than me! Some will look down on me because of this. Why you care so much about English? You daughter is born as Malaysian, Melayu. Why bother about English? I'm sorry as YES, I'm too much encouraging my kids to be able to converse in English. I don't know why. I'm sorry as I have no reason for that. I don't know why, I just have no idea to explain about it. One obvious reason that I know is, English needs practice. If you don't get used to it, you will be awkward. I remember when I first registered into International Islamic University Malaysia (IIUM), everything was so strange for me. Everything was in English. I chose not to ask the staff (even though it was important for me to ask), just because i saw the notice board stating "please speak English for inquiries". I didn't understand when the Ta'aruf Week 's committee asked me to queue, because I didn't understand what is "queue". I didn't respond when they asked me, is this your blanket?, because I didn't understand what is "blanket". So learning from there, I improved my English at the age of 18 years old (By now, I think My English is not that terrible anymore, after 5 years spending my time at IIUM). Therefore, I don't want my Aishah to be that embarrass when she grown up. I want her to be good and able to talk confidently. Yeah, that is the only reason I think. Forgive me if I'm overact! In parenting, there is no need to compare your kids with others. Kids are born special and unique! They are an exclusive creature by God!